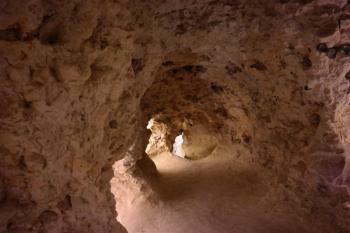 The Neolithic flint mines at Spiennes, covering more than 100 ha, are the largest and earliest concentration of ancient mines in Europe. They were actively used from 4400 - 2000 years B.C. 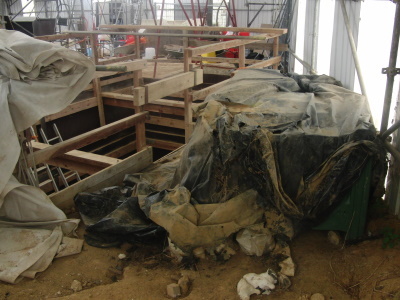 The extraction was carried out in open quarries and in pits. Flint is found in chalkland, there it forms layers within beds of chalk. It's an easy to shape material, with sharp edges. From the early beginnings, humans used flint tools for personal use. For example to make robust axes (to be used by hand or with a wooden grip). Probably there are thousands of pits in this area. There is no horizontal network that joins them. When a new pit was hewn out, the older pit was used to dump the rocks. It all was done on quite a small scale: no residential area was found near the mines, the flintknappers came from kilometers away. The site was used for excavations by numerous generations. Last months, I enjoyed the 'discussion' below among the visitors about how to get to the mines in Spiennes (and even more important - how to get in). But gradually the basic visitor information became clear: there are guided tours on the first Sunday every month, and you have to be very alert in the town of Spiennes to spot the site. To make it even easier: via the link 'Mining site of Spiennes' above there's access to a map. Besides an extra round on the Mons Ring road (there's only a small sign to Beaumont), I had no trouble finding it. In Spiennes the 'minieres' are even signposted. From above the ground the site looks remarkable like any farming field. The archeological excavations are limited to two areas: one official site and one for volunteers. One of the guides showed me around. First to some open excavations on the surface. 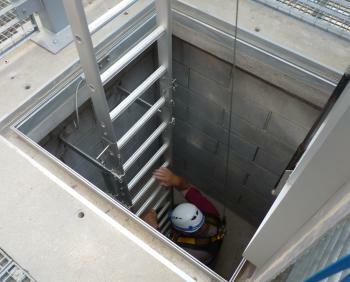 After that we descended a steep iron ladder, to get 10 meter below the ground. Here we arrived in a well-lit cave network (the electrical lights only recently installed). The difference between the white chalk and the 2 flintlayers was clearly visible. The guide explained the techniques used by the neolithic people to get to the flint. It was a tough and patient job, carried out precisely. An amazing experience to stand here thousands of years later. 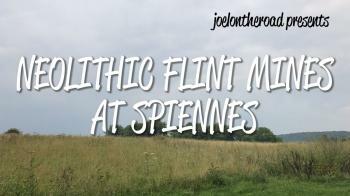 My wife and I visited Spiennes in August 2017. Contrary to the experience of other reviewers, we showed up randomly and managed to grab a free spot on the tour! It had just started so I missed the first few minutes, but it was in French and my grasp on that language is tenuous at best, so I didn't really miss anything. The guide was kind enough to give me the gist of what she was saying too. The mines were surprisingly large underground, and I really enjoyed seeing the pits. Also very startled to find that in the hundred or so acres of the site, there are thousands of mines but only a handful have actually been excavated! Makes you really wonder what else is yet to be discovered. Finally ticked off the last Belgian site! Was lucky to book mine visit on 26 August 2017. The price was 14 Euro. There was French speaking group and the guide first provided information for them and then English summary for me. Only 6 people decided to descend and we all went through hook hanging procedure. The mine is quite atmospheric, with several layers of flint stone. 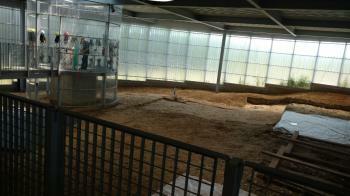 The guide showed "scratch" gallery, the only place, where there are visible traces of mining instruments. The other were destroyed by excessive visitors during previous less controlled period. The miners used debris and waste to use it as elevated floor level for mining upper flint layers. Polished flint instruments were probably used as trade objects as they were found in the radious of 150 km (but there is hypothesis that polishing of flint stones took place not in Spiennes but in other area). In overall interesting site and quite unique aspect of human activity is highlighted here. The difficulty of getting here also adds some charm. I liked the visit and some local dogs on the way from parking to the site. Thanks to Ryanair offering 30€ flights from Hamburg to Brussels I decided to finish Belgium by ticking off Spiennes. I contacted the museum and reserved a place for a Sunday afternoon visit. 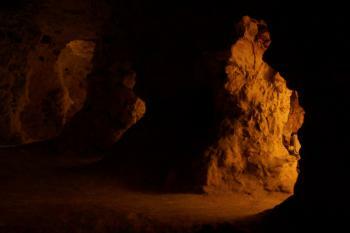 The visit includes the museum, an excavation site and a descent into one cave that covers several mines. Flintstone was the key material in prehistoric times. The mines at Spiennes show to what lengths mankind would go to mine it. They would dig 10-20m deep holes with little to no light and only very primitive tools to use. It’s interesting to think about this as an early industrial site. 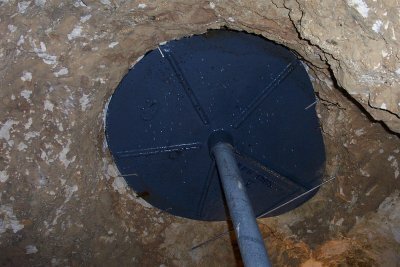 Similar mines are found all over Europe. The Polish tentative list even features one of them, Krzemionki. I am hard pressed to see why Spiennes would be special compared to the other mines. But seeing I am always arguing against serial nominations, I think having a flint stone mine on the list is fine. Even if the criteria was only that Belgium proposed this type of site first. Public transport options to Spiennes on the weekend are non existing. On my way to the museum I walked from Mons Trieux bus station (>1h). Another option would have been to go to Saint Symphorien. On my way back the very kind guide gave me a ride and dropped me off in Mons. Maybe you can arrange for her to pick you up, too, if you call the museum ahead of your visit. Your own car is obviously superior. Tickets can be reserved via mail. But when I showed up they had not received or could not find my reservation. It all worked out, apart from me potentially having paid twice. For your visit, please call the week before your scheduled tour to make sure everything has been forwarded. Mons has plenty of WHS in the near proximity, for instance the Wallonie Mining Sites and the Four Lifts. Mons itself itself is the site of one of the ubiquitous belfries. The site that tickled my interest the most was the World War 1 cemetery in Saint Symphorien, part of the World War 1 Cemeteries tentative site. It’s not that far from the museum, at least if you come by car. Unlike most World War 1 cemeteries this is dedicated to fallen soldiers of both the German and English sides. When my guide gave me the ride back into town, she explained that the landowner of both the flint stone mines and the cemetery was the same. He donated his land for the cemetery, but he demanded that it should be a cemetery for both sides. The location may have been a counterproposal as originally the old quarries were considered as location. In a way he protected with his donation the world heritage site. Without going into detail, we can confirm that arranging a reservation for a descent in the mine is a nice example of Belgian surrealism (cf. Solivagant's review). But after a few atempts we made it to Spiennes and we can also confirm that the local staff and guides are very helpful and knowledgeable. It seems that the parking close to the site is meant for the elderly and/or disabled, but you can park at the Rue du Petit Spiennes - Rue de Nouvelles intersection which is only a 5 minute walk to the site. The tour starts with an explanation above ground and ends with a descent in the mine. This last part takes some time since everyone has to get in/out of safety gear. 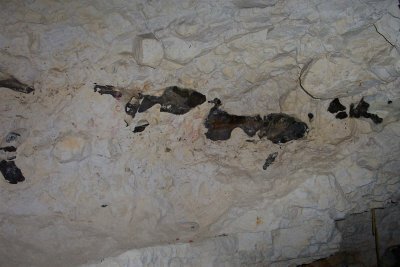 In the mine, three layers of flint/silex are clearly visible. In principle, taking pictures is not allowed but - as we have also experienced in a number of other Walloon WHS - the guides mentions that as far as they are concerned taking pictures is no problem (and that they only have to say it pro forma). Ps: the first Sunday of the month, the entrance to the site is free of charge. This is another fascinating WHS in Belgium, and I had to come back here after 4 months for the tour of the mine. I have taken tours at many World Heritage mines, in Norway, Sweden, Germany, Poland, Slovakia, Hungary (Ferto), Japan, etc, but this one is the oldest by far, which is part of the fascination. 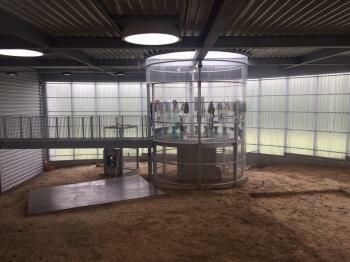 Photo 1: The Interpretation Center built over a flint mine. Photo 2: Inside the mine. Photo 3: Inside the mine. photo 4: View of Mons from the Interpretation Center with the World Heritage Belfry. Back in 2001 we had visited Spiennes to find ….. nothing but a field! So, when we were “over on the Continent” (note our very British way of looking at the World!!) for the WH Site “get together” in Aug 2015, we were determined to get more out of a repeat visit. We knew that a lot had changed across the 14 years, particularly in the form of a new Visitor Centre named “SILEX’S” (= “Silex i.e “Flint” of Spiennes”) which had only opened in April 2015 and which, apparently, offered more chance to make a descent than was previously available. So, I started trying to make arrangements in early July. At the same time I made a booking for the Rietveld Schroeder Haus – so easy with a simple Web booking system which operated with exemplary Dutch efficiency. But, oh how different for Spiennes!! At the risk of over-extending this review it might be of use to others who want to do a descent to recount our experience. The prime method for making a reservation is by telephone to Mons Tourist Office – not very “user friendly” for those living overseas! Trying to “improve” the system, I e-mailed the Tourist Office which passed me on to another e-mail address for the booking …. which, at first, answered my questions by simply cutting and pasting the information on the Web site which my e-mail made perfectly clear I had already seen! To cut a long story short it appeared that only pre-booked groups could descend at a price of “6€/personne + 95€/groupe de 12 personnes max pour la descente (que le groupe soit composé de 5, 10 ou 12 personnes, le prix est de 95€ pour la descente)”. Furthermore they would not “make up” groups or add to pre-booked groups of fewer than 12. NO mention was made of any way of joining a publicly available group. They didn’t even mention the “free” descent which I discovered elsewhere on the Web was available on Sundays in August to celebrate the Mons European City of Culture – generally their performance hovered between the useless and the positively unhelpful! All this was as per the Web site in French here - http://www.silexs.mons.be/accessibilite/informations-pratiques-1 which makes NO mention of any way for individuals to descend. However, just before we left for Belgium, I, for some reason, checked again on the SILEX’S Web site and switched to the equivalent page in English here - "http://www.polemuseal.mons.be/en/silexs-mons/accessibility/in-practice?set_language=en – there it said “ Individuals : Saterday (sic) and Sunday at 2pm 9€ / 6€/pers. for the entrance + 8€/pers. for the descent (reservation at VisitMons 065/39 59 39 or in the SILEX’S if there is (sic) still tickets for the day). I have just double checked and, as of Aug 27 2015, the French and English versions still give these 2 completely different stories!!! When you arrive at the village of Spiennes you will be directed to a parking area in front of St Amand Church. A sign board/map there might be taken as an indication that the entrance is nearby. In fact it is around 10-15 minutes walk away. If you do park there make sure you read the map before setting out as the route along the Rue de Prisonniers and then left along Rue de Nouvelles to a footpath climbing the ridge to SILEX’S via a new set of metal stairs isn’t entirely clear and later signs meant for motorists might lead you the long way round! If you have a car it is probably better to ignore this first sign and continue by a circuitous road to the site itself just off the Rue du Point du Jour where there is a parking area at N 50.420982 E 3.980263 around 200 metres from SILEX’S along a boardwalk. We were told that the good burghers of Spiennes were not entirely happy about the influx of tourists likely to arise from the new visitor centre and were trying to spread the load and control traffic to/from different areas. As Clyde indicates in his review, there is a 3rd car park reached from the village of Nouvelles but also situated a distance away. Generally I found the signage as confusing as the booking system! Having excoriated the Mons Tourist Office I should mention that the staff at SILEX’S itself were helpfulness personified and were clearly enthusiastic about offering tourists a good experience. If you have failed to acquire a reservation for a descent via the “Grand National course” already described, you are going to be limited to what is on offer in the Visitor Centre. This, in all honesty, isn’t wonderful. Inside the large circular building, top-soil has been cleared to uncover an area of flint pieces where “knapping” has taken place (these Neolithics weren’t stupid and reduced the flint to manageable shapes and sizes right next to where it was mined!!). There is also at least 1 visible surface indentation where there is a mine shaft. In fact a very detailed plan which we were shown, indicates that even the small area of this building covers some 10 or more shafts in addition to those used for the descent and, as yet, unexcavated. A factor in the design of the Visitor Centre and surrounding paths/car parks has apparently been to minimise disturbance. Thus the exhibition floor itself is largely suspended from the sides with a few small pillars to avoid the need to lay concrete foundations within the Centre. Beyond these genuine historical remains there is a small exhibition with some artefacts, both original and reconstructed, and a number of explanatory panels – interesting, but really requiring a sight of the “real thing” as well! The rest of the Visitor centre is given over to the descent shaft, a shop/ticket area, a conference room and toilets - not a lot for 9 Euro. 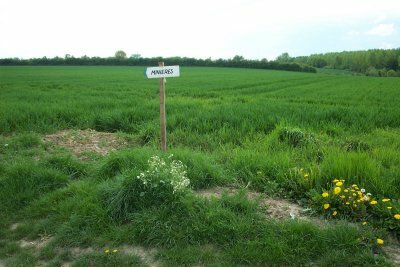 Those WHS enthusiasts who regard merely having been inside WH inscribed boundaries as being enough to “count” a visit should note that these extend across 170ha and include 3 mining areas - Petit-Spiennes, Camp-a-Cayaux and Versant de la Wampe (which also has remains of a Neolithic village). Since returning I have found this report about the entire site very useful - http://minesdespiennes.org/textes/Collet_Hauzeur_Lech2008.pdf. SILEX’S is situated at Petit-Spiennes and we made no attempt to explore the other areas. So, you could get your tick without even going inside the Centre! In the surrounding fields some surface disturbance from Neolithic mining is visible on the walk up from Spiennes (as well as more modern mining when the Flint was used for gun flint locks and glass making). In addition, at the moment, visitors have an additional opportunity for understanding the site. Around 30 metres away from the Centre is a large tent covering an ongoing excavation at which archaeologists were active (I gathered that it is likely to continue for some time yet). We received an excellent face to face explanation from one of them about that particular dig as well as the ability to see them working “down the hole”. The tent also contains yet more information boards and is a useful adjunct to or even free replacement for a visit to the Centre. We then had another stroke of luck – at 4pm on that day a lecture was to be given (in English) by a visiting professor from the Polish Institute of Archaeology and Ethnology (who was assisting at the dig) titled the “Neolithic Flint Mines of Poland” and, since it was “free entrance”, we thereby got in to the Centre for nothing!! Now, until I heard this talk, I just didn’t know how much I didn’t know about Flint Mining in Neolithic times!! Different types of flint and tools made from it, its geological origins, mining locations around Europe, different types of mines, trading and belief systems etc etc – as a result I have mentally “pencilled in” a visit to the Krzemionki mines (around 10kms NE of Ostrowiec) next time I am in Poland!! At least it seemed easier to get underground there! See http://krzemionki.pl/en/about-krzemionki/underground-route/ which says “The underground tourist route in Krzemionki is the world’s only such monument open regularly to visitors.”. We have also visited underground without problem at UK’s contribution to Neolithic Flint Mining archaeology at Grimes Graves in Norfolk (see http://www.english-heritage.org.uk/visit/places/grimes-graves-prehistoric-flint-mine/ ). Both of these sites are referred to in the Comparative Analysis section of the Spiennes nomination file but, whilst they are stated to be “complementary”, Spiennes claims pre-eminence on the basis of size and age. Apparently a noteworthy aspect of Spiennes is the narrowness of the necks of the pits compared with the other 2 locations – which explains no doubt how a wooden staircase has been fitted in at Grimes Graves compared with a narrow vertical ladder at Spiennes! But of course we still had to return at 2pm on the next day for my booked descent!! Our hopes that someone would have failed to turn up and create a spare place for my wife were dashed on arrival. The visit was scheduled for 90 minutes and commenced with a guided tour of the exhibition. We then got kitted up with safety harness and helmet. The descent/ascent for 12 plus guide each took around 10-15 minutes with each person being hooked up to the safety rope, descending the ladder (photo), being unhooked and the hook being returned to the surface. The explanation must have taken around another 30+ minutes and there was a bit more explanation at the surface at the end. You see the 3 bands of flint which the miners were following, a number of side galleries which indicate their method of working and another shaft filled in with debris. No photos are now allowed underground – I tried to explore why but no one seemed to know for sure. There are no prehistoric markings likely to be damaged by flash and with only 12 people the “crush” problem with selfie sticks etc which is so noticeable at major sites around the World nowadays hardly seems to apply. Even copyright hardly seems a valid reason with so many photos on the Web which can be cut and pasted – perhaps it is just another example of bureaucracy. I have similar feelings about the annual visitor limit - “Pour des raisons de conservation de la minière, reconnue par l'UNESCO en 2000, uniquement 5500 personnes peuvent descendre par an”. Although there are environment sensors underground, this, I suspect is more a sop to the locals concerned about too many visitors than a genuine preservation measure – this is hardly Lascaux with pictures being damaged by excessive moisture from the breath of visitors – and e.g Grimes Graves doesn’t seem to have a problem. 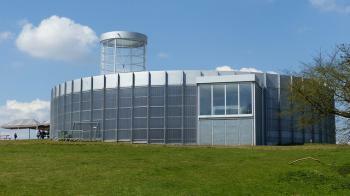 Despite these restrictions and the booking difficulties I would certainly recommend anyone planning to visit Spiennes to target a public descent on the Saturday or Sunday – what you will see underground isn’t fantastic but the experience of going down really seems an essential part of a visit whose surface interest is somewhat limited. Then came the final 2 surprises of our visit – the 12th person scheduled to descend got cold feet and couldn’t make it – so my wife was able to take her place! And, then, underground, one of the other visitors came up to me and said “Paul Tanner - I presume”!! It was Iain Jackson who was also taking in Spiennes whilst on his way to the Van Nelle get together and had spoken to my wife “up top”! He had done his booking a couple of weeks earlier by both phone and e-mail (I don't know which was first) targeting the Saturday descent which we had not even been told existed back in Early July – so the system does seem to be working a bit better now! I finally visited this WHS in April 2015. I say finally because I had been wanting to visit and 'complete' Belgium's WHS since 2012 when the site was closed to build a visitor centre and make it more accessible. The site was planned to reopen as early as 2013 but a series of postponements meant that the new interpretation centre was only inaugurated on Easter Saturday, 4th April 2015. The easter weekend was advertised as Mons' celebration period as European Capital of Culture 2015 and Silex's interpretation centre was only 1 of 5 new museums inaugurated during that weekend with free entrance. Well, I seized the opportunity and visited Mons and Spiennes. By car, Silex's is best reached through Hyon as now there are several signposts indicating the way to the site and there's only a short 10 minute walk on a flat terrain making the site wheelchair accessible. Otherwise the site is reachable through Nouvelles where again there are a series of signposts indicating the way to a dead-end amidst the Belgian countryside and fields. Cars can be parked here and a 12 minute walk on a muddy terrain past a 1915 aqueduct and water management area and a fleet of stairs lead you to the new interpretation centre. I opted for the latter only because I had time to kill and enjoyed some birdwatching along the way. The Silex interpretation centre proper seems quite futuristic and out of place compared to its surroundings yet at least the WHS is much more accessible and the experience is more informative overall. Outside the centre there were several excavations still going on and many archaeologists willing to explain the importance and the OUV of the 6000 year old site in Spiennes. Inside the interpretation centre there are several flintstones and tools displayed, many information boards, a projection room to enjoy a virtual descent into the mine with panoramic photography. To be able to descend the now fully lit Neolithic mine is quite a tall order in bureaucratic terms. However, where there's a will there's a way and by booking ahead from the tourist information office at the Grand Place in Mons I managed to be one of the 12 lucky visitors who got to climb down the extremely safe wide ladder (it's not the black narrow iron one any longer!) with a harness, a helmet, headlamp and IMHO excessive safety gear. The extra ventilation, lighting and safety surely comes with a hefty price tag, now costing 18 euros instead of the cheap 2,50 euro ticket charged until 4 years ago. For WHS enthusiasts, I would say it's a must to visit to get the full unique experience. That said, it really is nothing special (aesthetically) when compared to other WHS mines I visited worldwide. The most interesting geoligical fact I learnt from visiting this site was that raw flintstone is white from the outside and blackish grey inside. However I could have safely learnt that without descending the mine itself. Only a maximum of 5500 people annually are supposed to visit the mine by descending the ladder but I don't think that there will actually be that much of a demand contrary to what is the case with other WHS such as the Lascaux cave, the Chauvet grotto or the Altamira cave. It's worth mentioning that it's not possible to descend on Mondays and it's always better to call the Mons tourist information office to get an English archaeologist/guide and ensure that there are enough visitors on a given day (12 people minimum). The full experience including the descent to the mine will last around 2.5 hours. After hearing about how tricky it can be to gain access to this site, I figured it should be my aim to get to them as I visit Belgium pretty regularly. Now that the official website has all the relevant information and an exceptionally useful map, mixed with the end of my studies meant that a visit was possible. With the map it was pretty easy to find the site and there are a few small signs to point you there from the village of Spiennes. We turned up just as a group was going down, so after a brief introduction we followed them down. The mine we visited was 8-10 metres deep and to gain access to it you have a nice climb down a ladder. The main part of the mine was tall enough to stand in and had several different shafts. There were numerous different chambers, and you could see how they were sculpted and where the flint came from, in places there were even marks left by the Neolithic men who dug the flint out. Our particularly friendly guide was very knowledgeable and described everything we needed to know for a good understanding of these 6,000 year old mines. He also described how tourism in the mines worked. They are open 10 days a year and on average get about 150-200 visitors a year. It was a decision of a local politician in Mons to put the site forward as a WHS. An inspired choice it is not just a run of the mill World Heritage site. He also described some long term aims to explore a few of the other 10,000 mines in the area and potentially to build visitor centres and showcase them in a more tourist friendly way, without making it to "Disney". At the moment the biggest move forward has been to put lights in the main mine. At the end of the tour we were shown an on going excavation. Then we were shown, and allowed to handle, some of the tools used and produced in the mines. This was a great way to spend a morning and the staff were so friendly and informative. This is a place well of the tourist track, certainly a place I would have even heard of if it had not been for its listing but definitely worth making the effort to get to. A great choice as a World Heritage Site. During a trip to Belgium in June 2004 and specifically to the Wallonian area I had decided to visit the Neolitic Mines of Spiennes as my 138th World Heritage Site. Having arrived in the city of Mons, I jumped into a taxi heading for the small village of Spiennes were I had made an appointment with archeologist Helen Collet who was going to show me the site. She was waiting for me and we drove off to the first of the two archeological sites while telling me that the whole area of Spiennes is scattered with over 1000 Neolithic mines, holes in the ground, around 4-12 meters deep, where the ancient Neolithic men dug for flint stone about 4000 years BC. “Tools made from Spiennes flint has been found as far as in eastern Germany”, Helen continued. “But unfortunately we have only been able to investigate two mines so far. But these two are very deep, something that is quite unusual from that period”. The first of the two sites was housed inside a small building on top of the first “hole”, built by the archeologists who first discovered the mines in the late 19th century and now the office for the archeological investigations. After a coffee and some initial discussions about Neolithic mining with Helen and her husband Michel who now had joined the party, it was time to enter the underworld. My outfit of the day was completely discarded by Helen and Michel in favor of some more suitable clothes and a helmet. The min to be entered was about 16 meters deep and having been secured with an extra rope I descended down a slippery ladder into the world of the Neoliths. Helen climbed down after me and together we crawled round in the mine which was not more than 70 centimeters high and about 5 meters deep - indeed a claustrophobic experience. Crawling back up the ladder again also reminded me that I’m 41 years old and smoking too much and after surfacing and coughing for about 10 minutes, Helen told me that we now were going to the second hole....puh! The second hole was located on the other side of the small village and actually much easier to access. Not only was it just 10 meters deep but also spacious enough allowing you to stand straight up once down. Here it was also easier to study the work of the Neolithic man and understand how they had dug the mine and the techniques used. Visiting Spiennes was quite a unique experience and I would like to extend my big thanks to Helen and Michele for guiding me and learning me more both about modern archeology as well as Neolitic mining. The only downside is the fact that the City of Mons is not promoting the site what-so-ever. It is therefore hard to find and not possible to access unless you contact Helen in advance. This was a facinating experience! I am a "full-time" Flintknapper making my living by knapping flint. This site demonstrates the high prehistoric value of good quality knappable stone. The labor to extract this flint is staggering! Our visit was arranged by Pascal Chauvaux of Belgium. It was difficult to find, but find it we did! Thanks for the incredible tour! Thanks Pascal! Visited the site a few weeks ago. We found the on site archeologists very informative.Helene Collet afterword followed us to the museum to share more information. This area is a great experience for anyone interested in pre- history and flint technology. You can visit the mines every first sunday of the month. It's a very interesting experience and the guides are very kind. I have 'visited' this place twice, in 2001 and 2002. As you say, it does not seem to exist, at least it is impossible to find. When you reach the village Spiennes, the site is clearly marked with signs 'Sites prehistoire de Spiennes', but when you have gone through the village, all traces disappear. There is no way to find out where to go. I went to the tourist office in Mons, and they had a brochure saying that the site is closed until further notice, because of the dangerous condition of the site. But why do they insist on having the signs along the streets??? Of my 230 sites, this has been the most disappointing. I tried to visit the Flint Mines at Spiennes this 6th October 2002, but there was no possibility to visit, nor any indication whatsoever of Time when this was possible etc. 3.0: Ian Cade Alexander Barabanov Frederik Dawson Peter A.